Julia Stiles Engaged to Preston J. Cook: See Her Round Engagement Ring! Actress Julia Stiles, known for her roles in 10 Things I Hate About You, the Bourne franchise, and Dexter announced her engagement to Preston J. Cook with a photo of her round engagement ring on Instagram yesterday! The 34-year-old Save the Last Dance star will be sharing her first dance with future-husband, camera assistant Cook thanks to his Christmas Eve proposal. The couple were vacationing at a private residence in Isla Grande, Colombia for the holiday when they got engaged on December 24, 2015 but waited until Monday, January 4, 2016 to reveal the new round rock! “Best. Christmas. Ever,” Stiles captioned the Instagram photo which shows the couple’s hands clasped together in front of an ocean-filled, sunset background. The solitary diamond engagement ring encased in gold is front-and-center in the photo. With the light fading in the background the round engagement ring almost seems to glow. Stiles and Cook first met on the set of the thriller Go With Me, and the romance quickly blossomed. When the actress was asked “What was the best kiss of your life?” during an interview with The Guardian in July, she revealed her relationship with Cook saying, “It might have happened this morning. I am dating a camera assistant I met at work called Preston.” Sounds like it was meant to be from the start! Cook was most recently found working on Leonardo DiCaprio’s The Revenant, and among other projects Stiles is reprising her role as Nicky in the newest and as-yet-unnamed Bourne sequel she’s currently filming alongside Matt Damon. 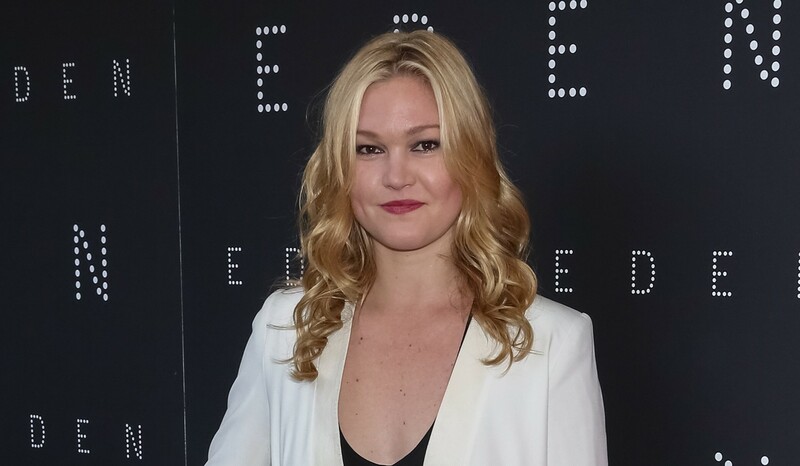 Be the first to comment on "Julia Stiles Engaged to Preston J. Cook: See Her Round Engagement Ring!"